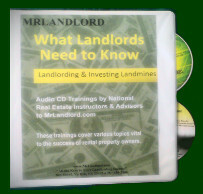 These 16 audio CD trainings are presented by highly respected national real estate instructors in their area of expertise, advisors to MrLandlord.com and by Jeffrey Taylor, Founder@MrLandlord.com. These trainings include various key topics VITAL to the success and survival of rental property owners. You can order ALL 16 of these eye-opening CDs and you will receive a 60% discount and save over $400 off the individually priced CDs. The discounted price is only $199.95. The knowledge and insight of all the instructors in the set are well worth tens of thousands of dollars. Just one idea from each CD can help you save thousands of dollars by avoiding one or more of the many costly landmines that unfortunately so many rental property owners are severely financially injured. The entire CD collection will be shipped for free to you. They will be sent in a special audio collection binder.